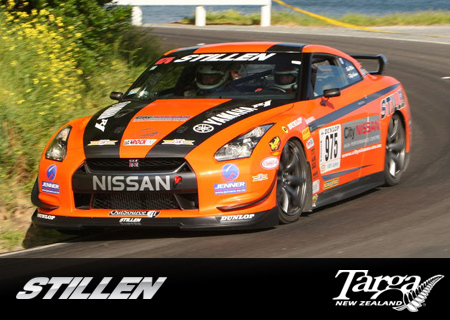 The STILLEN Nissan GT-R is once again back in action for the 2011 Targa New Zealand. In case you missed it, the New Zealand All Blacks defeated France to win the Rugby World Cup for the first time in 24 years, so New Zealand is celebrating the win. All of New Zealand might be a bit slow to start off this morning. For 2011, the STILLEN car has a few upgrades to help it better compete against the other cars. Last year, STILLEN finished 3rd with a conservative strategy, but this year, they may hang it out a little more. We spent Saturday and Sunday wrapping up the final adjustments to the car, ride height, tuning (special thanks to Jack at Horsepower Logic) etc. Overall preparation has been relatively easy. We added some adjustable rear toe arms as well as changed springs, injectors, and a few other little tweaks. Wishing Steve, and the rest of the team good luck for the event. I will try and keep a running update of the stages. The rally is just getting ready to start now, Tuesday in New Zealand.